I needed a break from the science fiction and action/spy books I had been listening to so I decided to through in something completely different and you can get much more different that Titus Groan. 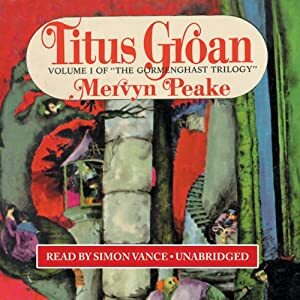 Titus Groan is the first book in the Gromenghast series of book written by Mervyn Peake who was an amazing illustrator and writer. The Wikipedia article on Mr. Peake is full of really interesting information about his life and works. The language in this book is absolutely astonishing. I have never heard anything else like it. I highly recommend reading or listening to this book to experience the use of the English language alone. So stop what you are doing and go do that now! Robert Whitfield does an amazing job bringing all of the characters to life and making the language of the book the star. In Volume 1 of the classic Gormenghast Trilogy, a doomed lord, an emergent hero, and an array of bizarre creatures haunt the world of Gormenghast Castle. This trilogy, along with Tolkien’s Lord of the Rings, reigns as one of the undisputed fantasy classics of all time. At the center of everything is the 77th Earl, Titus Groan, who stands to inherit the miles of rambling stone and mortar that form Gormenghast Castle and its kingdom. In this first volume, the Gormenghast Castle, and the noble family who inhabits it, are introduced, along with the infant firstborn son of the Lord and Countess. Titus Groan is sent away to be raised by a wet nurse, with only a gold ring from his mother, and ordered to not be brought back until the age of six. By his christening, he learns from his much older sisters that epileptic fits are "common at his age." He also learns that they don’t like his mother. And then, he is crowned, and called, "Child-inheritor of the rivers, of the Tower of Flints and the dark recesses beneath cold stairways and the sunny summer lawns. Child-inheritor of the spring breeze that blow in from the jarl forests and of the autumn misery in petal, scale, and wing. Winter’s white brilliance on a thousand turrets and summer’s torpor among walls that crumble…"
In these extraordinary novels, Peake has created a world where all is like a dream – lush, fantastical, vivid; a symbol of dark struggle. I rate Titus Groan a 9 out of 10 and recommend it to anyone fascinated by the English language. I do not like Zombie books or movies, I have read some of the more mainstream books and have seen all of the mainstream zombie movies, but in general, I do not like them. Although I make an exception for The Walking Dead comic book series which unlike the TV show continues to be amazingly fantastic (the TV show is merely good). 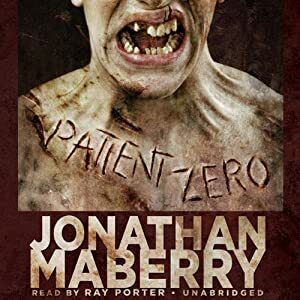 I chose to listen to the Patient Zero audiobook because the publisher’s summary did not make it sound like the run of the mill zombie book. More like a Jason Bourne meets Dawn of the Dead, plus I saw that it was the beginning of a series of books instead of a single book, sign me up. Joe Ledger is a great character, and author Jonathan Maberry does a great job of making him the hero while leaving room for the other characters in the story to have their moments. He strikes a really nice balance that many other authors miss. Ray Porter does a great job narrating; he brings the story to life while the strength and forcefulness of his voice are perfect for the Joe Ledger character. From multiple Bram Stoker Award-winning author Jonathan Maberry comes a major new thriller that combines the best of the New York Times best-selling books World War Z by Max Brooks and James Rollins’ Sigma Force Series to kick off the start of a new series featuring Joe Ledger and the Department of Military Sciences. When you have to kill the same terrorist twice in one week there’s either something wrong with your world or something wrong with your skills – and there’s nothing wrong with Joe Ledger’s skills. And that’s both a good and a bad thing. It’s good because he’s a Baltimore detective who has just been secretly recruited by the government to lead a new task force created to deal with the problems that Homeland Security can’t handle. This rapid-response group is called the Department of Military Sciences, or the DMS for short. It’s bad because his first mission is to help stop a group of terrorists from releasing a dreadful bioweapon that can turn ordinary people into zombies. The fate of the world hangs in the balance. Jonathan Maberry is the New York Times best-selling and multiple Bram Stoker Award–winning author of Ghost Road Blues, the first of a trilogy of thrillers with a supernatural bite. A professional writer and writing teacher, he has sold more than 1.000 articles, 17 nonfiction books, six novels, and two plays. ©2009 Jonathan Maberry (P)2010 Blackstone Audio, Inc. I rate Patient Zero a 9 out of 10 and recommend it to people who love military/police thrillers. Wow, this is a long audiobook. Just looking at the length of it at 36 hours 27 minutes, I know that sounds long but it is nothing compared to just how long this book feels. I repeatedly thought the story was winding down and coming to an end only to have it pick back up again and go on for hours longer. But don’t let that fool you. This is a really good book and an amazing story. The Great North Road is an epic story spanning multiple worlds, aliens that are truly alien, and a human race that is in fear of extinction. The Angela character and her story really got me, she was easily my favorite character in the story with Sid being a close second. People doing the hard thing because they think it is the only choice they have that will result in a better life for their family. Really good stuff. Toby Longworth does an admirable job trying to give each character a unique voice, but there are so many characters that it is an impossible task and from time-to-time I was quite confused about who was speaking and even where the speakers were, what world they were on. Don’t let any of that stop you from reading or listening to this book though. If you have the patience for really long space operas, this is Peter F. Hamilton after all, you will really like this one. A century from now, thanks to a technology allowing instantaneous travel across light-years, humanity has solved its energy shortages, cleaned up the environment, and created far-flung colony worlds. The keys to this empire belong to the powerful North family – composed of successive generations of clones. Yet these clones are not identical. For one thing, genetic errors have crept in with each generation. For another, the original three clone “brothers” have gone their separate ways, and the branches of the family are now friendly rivals more than allies. Now Sid must navigate through a Byzantine minefield of competing interests within the police department and the world’s political and economic elite…all the while hunting down a brutal killer poised to strike again. And on St. Libra, Angela, newly released from prison, joins a mission to hunt down the elusive alien, only to learn that the line between hunter and hunted is a thin one. 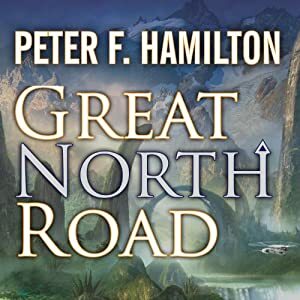 I rate Great North Road an 8 out of 10 and recommend to anyone who loves a good space opera.